As I write today's entry, I am enjoying a plentiful plate of freshly-picked, fried bananas with a cup of beans and a tall glass of flavorful juice. A slim wooden shade covers the panoramic view of Lake Nicaragua, filtering the sound of the waves crashing on the volcanic sand. I have really struck paradise, yet something is quite not right within the bottom half of my stomach. No, I am not talking about Moctezuma's revenge tearing my intestines apart; I am talking about self-disappointment. But why would I experience that in such a setting? 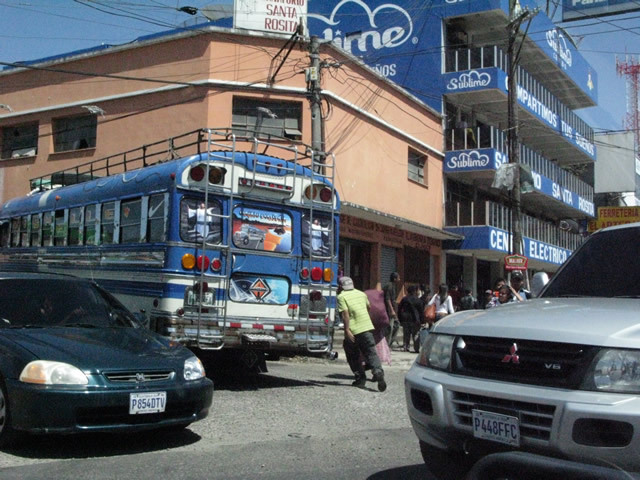 I left Antigua very early, anticipating some heavy traffic on the way to the capital. I drove through the financial district on to a wealthy gated community where the Galileo University happened to be, and as soon as I got in, I asked about the location for the GMAT test. I was led to a tiny office with a very friendly gentleman, who explained the process and went over the examination protocol. Once sure of the test's precise location, I spent close to hour and a half lying in my car with my laptop on my stomach, studying quantitative and grammar exercises I had reviewed a thousand times back in Antigua. As soon as it was time, I stepped confidently into the test room and locked myself up for the following three hours with the utmost sense of concentration. As soon as I was done, the computer displayed the product of two months of study: a meager 510 out of 800. I was demolished. This score would not only prevent me from getting into any single reputable business school, but the test itself had cost an astronomical –and, at this point in the trip, irreplaceable- $250 to take. With my own share of frustrations, I had studied anywhere from two to six hours ever day for the last two months, bumping my practice tests results from a mediocre 540 to a solid 610. I was beyond disappointed on the amount of time and money invested, and the huge price –right here, in the middle of the expedition– that it would cost to prepare again and retake it. 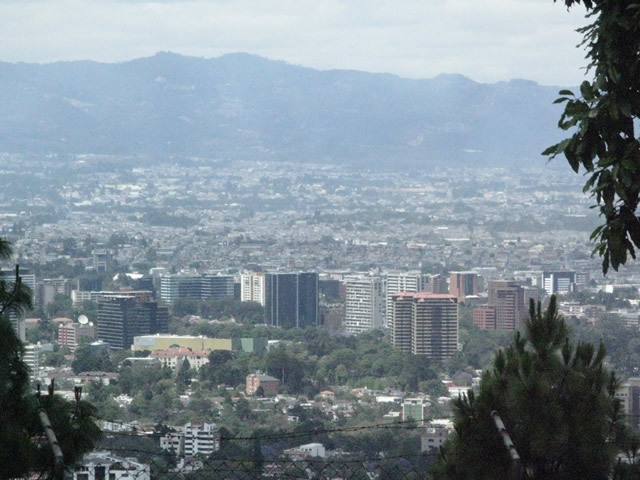 Downtown Guatemala City, a monumental and peaceful district that rivals in cleanliness to most US cities! Tormented by the sudden closing of the MBA route for my USA return, I drove on to an enclosed parking lot and lied in the back of the car, thinking strategically about the remaining options after the end of this expedition and convincing myself that six years of mathematics cannot be brought back to life in two months. The next day I stopped by the Mercedes-Benz dealership to take some photos and say goodbye, ready to push on to San Salvador that same day. On the steep climb from Guatemala City, I found out the coolant flush in the car had done its job! 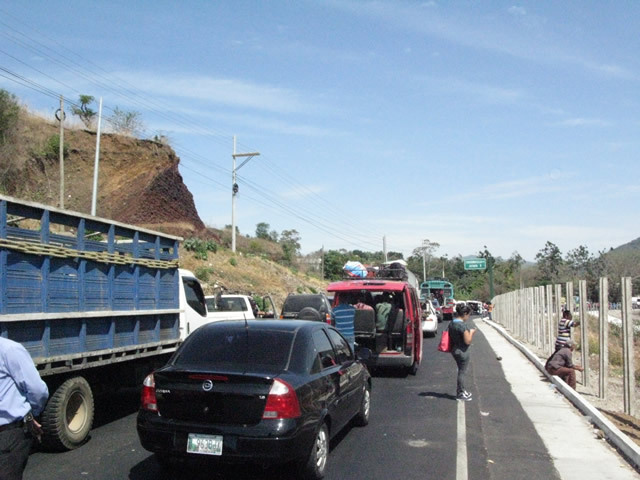 The Great PanAmerican Highway, or Highway One, is a seamless, well-paved stretch of road that connects Guatemala City to San Salvador. Once in Calzada Roosevelt (yes, there's a big avenue dedicated to the US president), it just became a matter of continuing on track through steep hills, iron bridges, fun mountainside curves and long, flat stretches of asphalt crowded with Chicken buses. Part of the route was down for maintenance, and that delayed the trip close to hour and a half. Since I was not in any hurry, I talked to my neighbor and enjoyed the view of the valley, where some road workers were moving out large areas of rocks they had dynamited earlier. I arrived to San Salvador at 7pm, a little after sunset, to find a surprise. The land where "right of way" is something out of a fairytale book. Traffic jam somewhere in the mountains of Guatemala. We all turned off our engines and talked to each other! The hostel was at full occupation. However, I triple checked that the neighborhood was safe and saved myself some money by camping right outside the hostel door in one of the fanciest neighborhood in San Salvador. The town is not half as scary as people depict it, and comparatively speaking, it is a little white lamb compared to Guatemala City. Colonia Escalón, with plenty of police watching the streets. Proof that you can safely sleep in your car in this country! 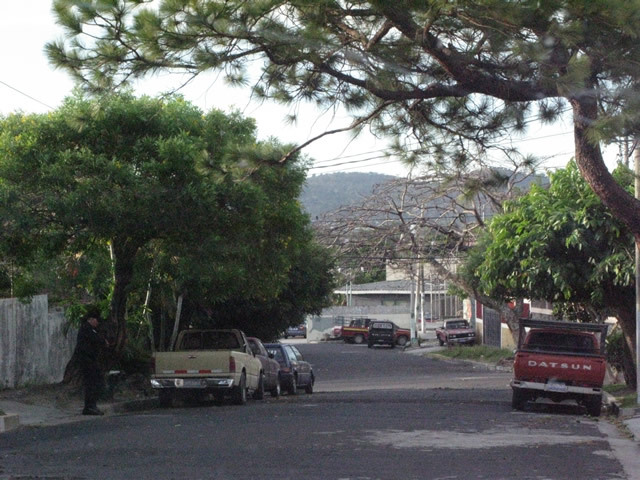 The rest of the drive through San Salvador was pleasant. People often imagine this country as one of the most dangerous in the world, but in recent years the authorities have made a huge effort to attract foreign capital and clean up the streets in most major towns. As you cruise its two-lane highways, you will find many signs urging drivers to be courteous, as well as any brand-new gas stations and markets owned by foreign firms. Things seem promising in this little nation! 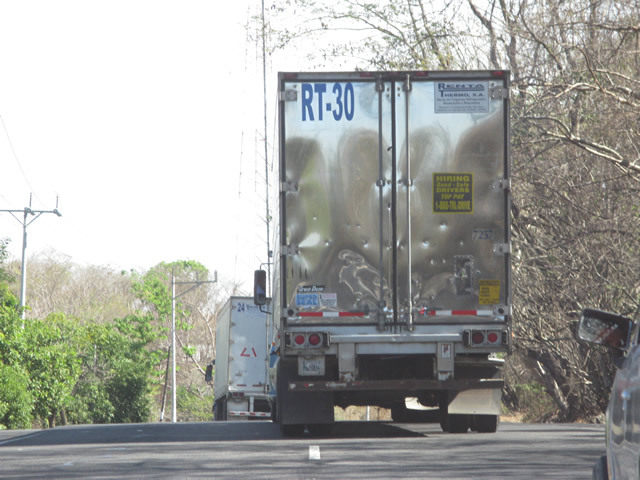 Ladies and gentlemen, those ARE bullet holes in the back of that Honduran eighteen-wheeler. Things were soon to change. The border with Honduras was announced by a long row of stationed trucks, followed by many "facilitators" for your paperwork. At the border, many curious –envious– eyes glanced at the shiny Mercedes, as a troop of kids followed the car into the parking lot. With all banks closed on Sunday and the customs building running on generator power, I decided to stick with one of the facilitators and for $4 extra –and a few biscuits I gave away– I was out of that place in 45 minutes. For 2/3 of the way, road condition was pretty good, so I sped up to 80mph through the vast nothingness of Central America's most dangerous nation. Along the way I plowed through a forest fire out of control, and saw many an example of misery that the Western World had considered to be part of the past. I did see a family living in a small hut, surrounded by all kinds of possible garbage that careless drivers had dumped in their property, with some of it burning in a small bonfire right next to a group of kids. One feels lucky to be in a position of privilege –to live in a healthy environment, to pursue one's passions–, with the boiling anger of seeing these people being forsaken by their governments and their neighbors. Ironically, just a few miles away, hoards oblivious tourists flock to the beach to –wastefully– re-enact the same things they do at home... cheaper, with better weather and more alcohol. Honduras is, no doubt, the poorest country in Central America; it is a place of desperation and worthlessness for human life. Very unfortunately, politicians do not read travelogues, and so, I swiftly conclude this frustration-drenched, Human Rights rant. Hooray for seat-belt laws! 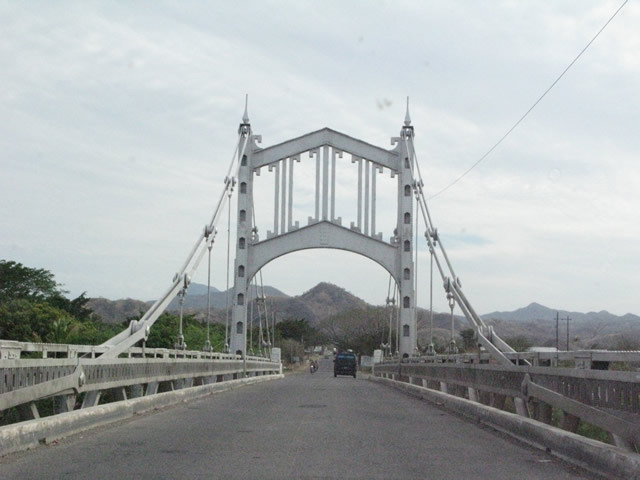 This bridge is right next to Choluteca. In just a jiffy I stopped at the peak of danger in this route: the über-sketchy Honduras-to-Nicaragua border at Gaussale. This time people were not only glancing with greed, but physically touching the car and running along with it in such dangerous –and foolish– fashion I could actually have hit or run over someone! This frontier is one of these places where your intuition will scream for you to get out of there, but to top it all, I arrived fashionably in a nice, complete, well-preserved and freshly-washed Mercedes. I paid a little kid to watch the car, as I dodged the border touts and got my passport stamped. At the other side of immigration, in a rather uninspired concrete shell administered by an equally uninspired lady, I got my customs import permit canceled and got back to the car, circling it a couple times to double-check, to find that my license plate screws had been loosened... Still, the kid showed up a minute later to claim his reward for his "attentive" vigilance. 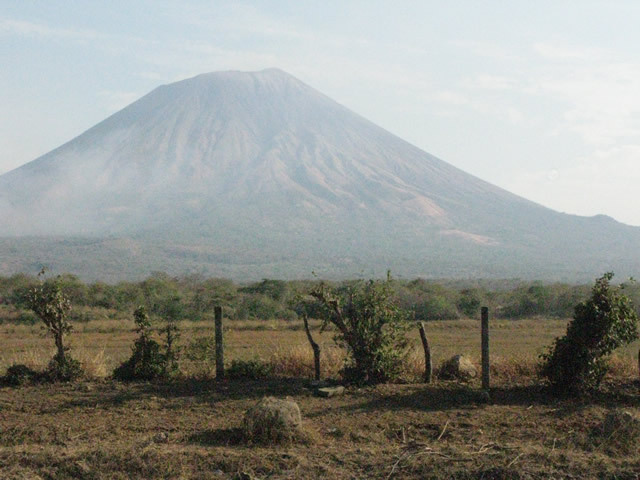 GORGEOUS Volcán de San Cristóbal, a few miles down the border with Honduras. 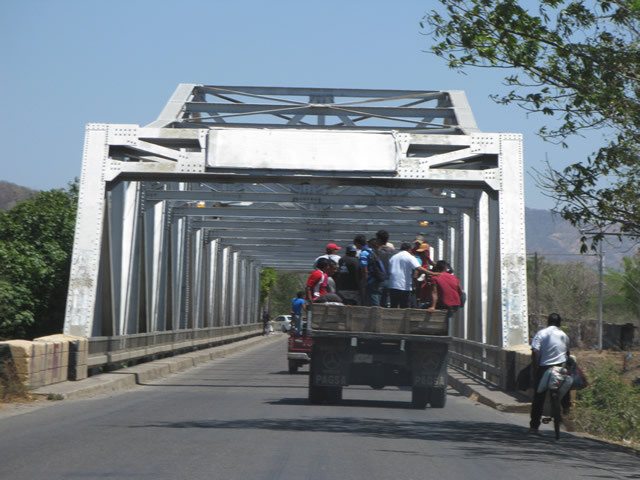 I crossed Nicaragua with a sigh of relief. The difference between the two countries is like night and day; my "sixth sense" went back to normal and the road became smooth all the way to the town of León. There is not doubt in my mind that this has been the most dangerous portion of the trip so far, and I keep my fingers crossed for the Panama crossing and Perú, where a few fellow overlanders have had problems. Still, my car and I happily report in one piece, with all our belongings intact. Even a week later, right in the beautiful shores of Ometepe, I still feel a mild sense of disappointment about the GMAT; however, remembering the extreme poverty I have seen, I must relegate this worry as a first world problem. I have myself, and I have my courage, with the talent to get back to the United States through the Big Door once again... and triumph. But first, let's not get ahead of ourselves and enjoy this expedition, shall we?